You guys are right on the money, have either of you ever herd of a product by the name Ice 32 ? It is an additive for your pag oil. And yes it does work . Most of the after market compressors are in stalling when they rebuild them. You can reuse the old condenser ,Receiver dryer and expansion valve with out any issue`s. Now after you get it all together your going to need to pull a vacuum on the system. Todays machines do this in 10 minutes . I will never do a 10 minute vacuum on anything that has been exposed to the atmosphere . This is where you should do a 30 minute vacuum . What I will do is add enough 134A to get the compresser to cycle with the car running, with the hood closed until it`s up to normal temp then recover and vacuum. heres the reason why I will do it this way. Once the system is open you allow moister into the system. By adding some freon into it and running it up to temp your turning all that into a gas form . It`s a heck of a lot easer to recover gas than liquid. Now lets go back to Air flow. This can be one of the most important things when dealing with any A/C system. If air is allowed escape around the condenser by way of the sides top or bottom you can actually raise your vent temp by 10 to 20 deg easy . I have used everything from plain house sponges to foam wrap for the house,heck I`ve even used plastic part out of other cars or trucks force air over the condenser . So if you have any space between the radiator and the condenser find some way to fill the gap. I have had no interest in experimenting with alternative refrigerants. R134 is available and it works and simple tools are available for it's use. By in large I am working with systems that are or were working and require minimum repairs to them to make them work again. You have to keep in mind one thing, here is Phoenix A/C is about as valuable an automotive accessory as a steering wheel and most vehicles worth looking at to purchase had factory A/C installed or some times at least dealer installed aftermarket. So retrofitting an installation is not generally a problem, maintaining what is there is. Unlike Frank, I have no problem using existing hoses if they appear to be sound and not dry rotted. There automotive A/C parts suppliers around and while some parts used by AMC if needed are no longer available, by in large AMC used a variation of an existing part that can be purchased, disassembled and re-assembled in a different configuration and have it workable and function. For the most part, the TSM gives enough information to trouble shoot A/C reliably if you take the time to read it and my tools are simple, the pressure line that can be purchased with an R134 can. A non contact temperature sensor to measure temperatures at various points, a thermometer that can be inserted in a vent and R134 is available anywhere. If backed into a corner I can call Bob. And a volt meter or two. I don't always agree with everything unclejohn says, most of time I do, this time I do. It's difficult to tight the logic of using products that are easily found locally and everywhere one goes. Lately I've seen a repop evaporator coil (I assume it's designed for R134A) for the 70 Javelin on ebay, and I've really wanted to get it. But when unclejohn says he isn't having troubles with his 70Javelin, factory coils, and R134A, I hesitate to spend money on a different coil without at least trying my hybrid frankenrambler A/C system. There is a legal issue with using something other than what is most common. The EPA treats ALL products marketed as refrigerants the same, regardless if they are environmentally friendly like the ES-12 or not. So while if you vent ES-12 to the atmosphere you've done no harm, you can still be fined for venting refrigerant into the atmosphere, which is illegal to do on purpose (well darn, a hose or seal came loose... it happens!). All refrigerant must be recovered, and mixed refrigerant can't be reused. Shops have to have separate equipment to work with and recover each type of refrigerant they work with. So unless they are set up to work with say ES-12, they will have to evacuate the system into a "junk" collection tank (to later be destroyed) and then charge your system. It think the rules have changed as far as using the same charging equipment for multiple types, but storage and recovery hasn't. All is supposed to be recovered, and recycled when possible. There is a fee to recover and destroy non-recyclable refrigerant. So unless there is a shop that uses the alternate refrigerant nearby or you can DIY you're better off with R-134a. If you go on lots of long trips or expect to move around some that's the safest bet. Otherwise if you're a few hundred miles from home and have an AC problem you have to wait until you get back to get it fixed. That's no big deal to me, but to some it may be unacceptable. Thanx for the vote of confidence (I think that is what it was anyway , but a slight correction, I was referring to my 1980 Spirit. It is all OEM or was anyway up until I damaged the condenser removing the battery a couple of years ago. The replacement condenser fit (a primary requirement in an old car) and I really do not know whether the replacement condenser was designed for use with R134 or Freon, but really didn't care, it fit! It was the second one ordered as the first did not fit although it was supposed to. However the car has been working with R134 since about 2002 or so. Yesterday I drove the car down to the tire dealer to pick out new front tires for my Hornet and it pulled cabin temperature down to tolerable by the time I got to the 2nd stop light. 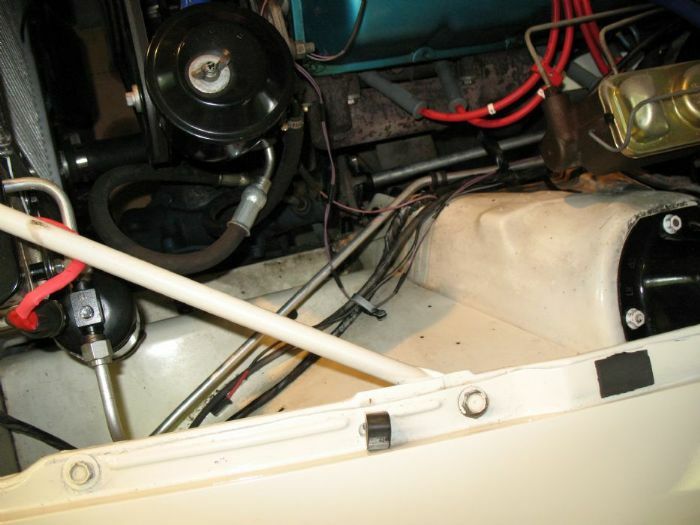 (It was 104 at the time) I am installing a "Vintage Air" under-dash unit in my 1970 Javelin as at the time when I ordered it, they had no in-dash unit packages for AMC cars. 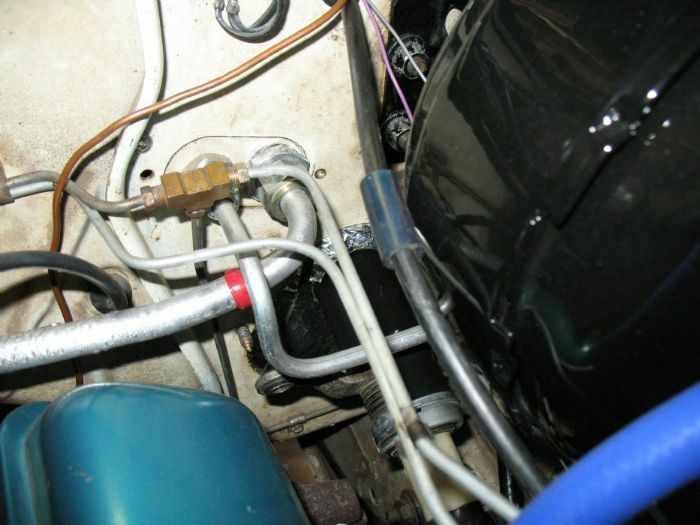 Their package consists of the under-dash unit itself, with wiring, a hose kit (to be assembled) and a Sanden compressor. NO engine mounting parts at all. So for the 390 V8 engine used in 1970 I was able to locate all the parts used by AMC except the idler which I am still looking for. I used an adapter to mount the compressor on the old York type mounting hardware. You also selected from Vintage air stock, a condenser you thought might fit and the one I selected did. The Vintage Air A/C pieces were designed to be used with R134. Fast forwarding from there to different years, my Hornet is going to use a "Franken-A/C" Package. The Compressor is a GM "Muffin" (or R4) compressor. The under dash unit is a unit sold and installed by the dealer when the car was new and is still functional. It has flared fittings on the hard lines and uses barbed fittings and hose clamps on the rubber lines. As the original set up used the schrader valves that were mounted on the compressor, I am using adapters purchased from Vintage air to get both the high and low pressure schrader valves, but also adapt the "R4" compressor to the barbed fittings for the rubber lines. I have no doubt that it will work as designed while still keeping the period correct look of the dashboard of the car. It did teach me though that while this A/C unit probably was installed when the car was new and worked for a period of time anyway, it was a truly lousy installation. Interested in this topic. 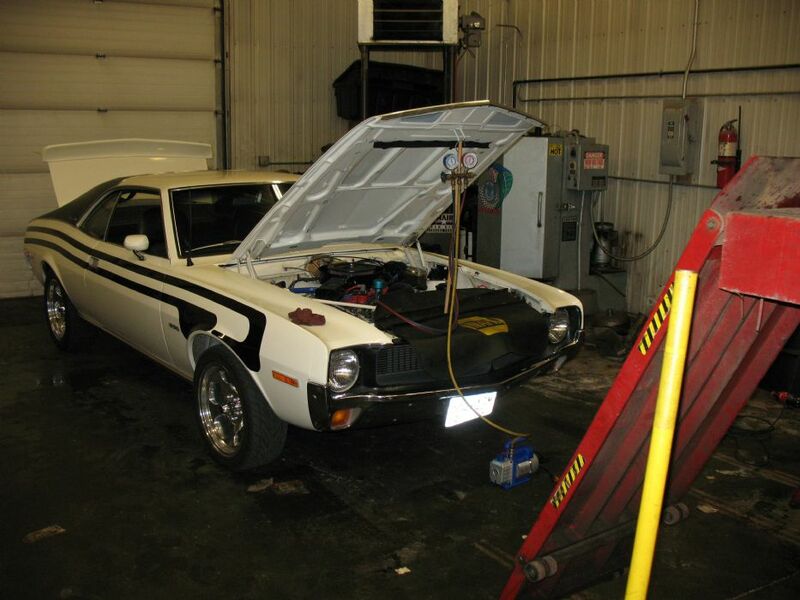 My 70 AMX had factory air that had been half stripped and lost by the time I got it. I've collected most of the needed parts. Someday soon I hope to get it working. My only experience with Auto AC is from 40 yrs ago working at a AMC dealer. It was this time of yearn, hot and humid in Iowa, and folks were bringing them in to get the air working. Most of the time Freon had leaked out around the compressor seal from non use during the winter and it dried out. We would dump the gas (gasp) change the seal, and vac it out for a minimum of 30 min. Applying vacuum lowers boiling temp to around 60 degrees and moisture would boil out. Longer on the vac pump meant fewer returns, remember being told that many times. A/C was a luxury item when I started driving a car. Or to be more exact, a heater was an option then too. I've owned two vehicles that did not have a factory installed heater in them. And as this was in upstate N.Y. at the time, if you wanted to drive your car between October and April you installed an aftermarket heater. Which generally did not even have provisions to install a defroster with them. You kept an Ice Scraper on the dash board to scrape the frost away from the inside of the windshield so you could see out with out opening the door window and sticking your head out. All of the above methods used at one time or another. A/C installations have changed quite a bit since that time. Initially most of the trunk was filled up with the stuff needed to cool the car. Those neat looking window things that have a funnel on them and sit on the top of a partially closed door window are evaporative coolers or known "as" in this neck of the woods as swamp coolers are filled with ice cubes and last about 20 miles before needing to be re-filled. Of course you could get bigger ones. For those of you who live in the colder sections of the country the same thing is known as a humidifier. Water runs over a filter unit that air is blown through and the damp air either adds humidity to the house in the winter, or slightly cooler air in the summer but are only good if the average humidity of the atmosphere is below 30%. I saw a 1956 Lincoln Premier Sedan with one installed in the trunk. The Point? If there is one, the reliability expectations and the performance specifications to be met are dependent on where you live. I never had an A/C equipped car (2 did not even have a heater) when I lived in upstate N.Y. I thought it was great that a Chrysler 4door hard top I had used a type of a flow through ventilation where air going through from the front vents to the one just behind the rear window would blow your hair (when I had some) with the windows closed and tinted to keep the heat from the sun out. The next car I had was a new Plymouth Valarie with Factory A/C. But that was in Southern California. When you go from not even having one and if you did, used a couple of hot days of the year, to using one all the time even when it was night time, your concept of reliability changes a whole lot. When I work on a car I only have one person to satisfy! That is me. And I have been making myself happy for over 50 years now. I build mild customs with motors that can be driven on the street reliably and fast. I am not overly concerned with gas mileage although better good, fast is better yet. For the most part, they have to be tuned to pass smog and the A/C if installed will work and keep the cabin cold. It is 2PM, 100 degrees and the humidity is high at 16%. So the humidity is up and the temperature is down. It is not a bad day. As to tuning to favor quarter mile times? I could care less. I know it is important to some people, it is not to me. Quarter mile state of tune and road manners are not very compatible. and while I have built V8's, I have also built some phenomenal in line engines too. I do not have an unlimited budget so a of my engines are low budget critters that run good. I have had good luck with Iskenderian cams, I have not lost one yet and AFB carburetors work really well. If I need a carburetor I hit a swap meet, buy a used one and rebuild it. Performance ignitions have a place, but until that place is needed, OEM ignitions get the job done. It Works, got the system charged with some help and it worked correctly right away. Blows 55 degrees out of the ducts at 700 rpm idle. Put in 2-1/4 lbs. of R134A. Remember the car has the original evap coil and a NOS condenser from a 74 Javelin. The air temps today reached 85 degrees with 70% humidity. I had the air blowing on me during a 20 minute cruise, I got chilly. Wow, that is some setup... Will probably do similar with a Sanden compressor and my 71 Evap and Condenser, modded to fit the connections.